The first time that you connect to a network, Windows automatically creates a network profile and stores it on your computer. Your computer can then automatically connect to the network in the future, and your preferences for that network will be used. A wireless network profile will use the SSID of the wireless network (ex: router) you connected to as the default profile name on your PC. This tutorial will show you how to change the name of a wired (ex: Ethernet) or wireless (ex: Wi-Fi) network profile on your Windows 10 PC to any name you want. You must be signed in as an administrator to be able to rename a network profile. 7. When finished, you can close Registry Editor if you like. 8. Sometimes you may need to sign out and in to fully apply the new network profile name. Local Security Policy is only available in the Windows 10 Pro and Enterprise editions. This option will override the name set in Option One above. 1. Press the Win+R keys to open Run, type secpol.msc, and click/tap on OK to open Local Security Policy. The default setting is Not configured. This will have the network name be what is set in Option One. 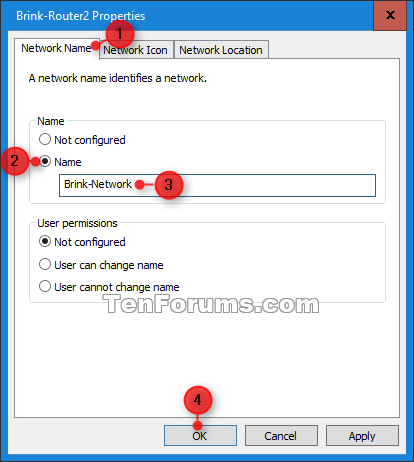 The network name you enter here is stored in the NeworkName string value in the registry key below. 6. When finished, you can close Local Security Policy if you like. 7. Sometimes you may need to sign out and in to fully apply the new network profile name. Posted by Vektor Web Solutions on четвртак 21. децембар 2017.